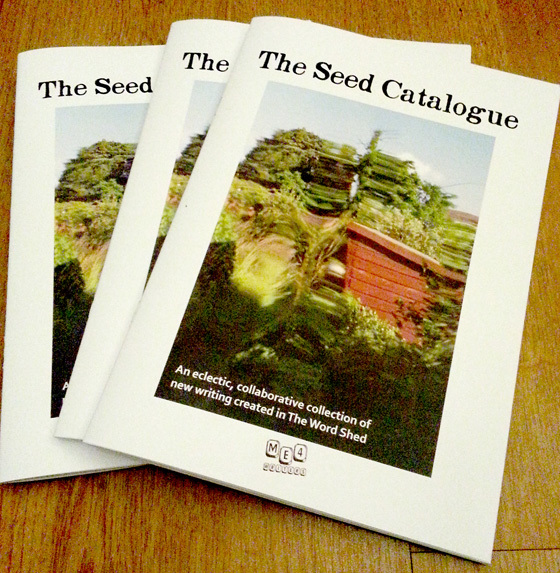 We are delighted to be able to launch our new collaborative booklet of prose and poetry ‘The Seed Catalogue’ from tomorrow at the FUSE Medway Festival. The booklet has been put together from contributions to our wordshops over the past month, and showcases writing from 24 local writers, some of whom had not written before, some of whom are already writing. The booklet has a range of writing inspired by the topics of Medway and Festival, and it was a delight to read the varied contributions and put the booklet together. You can come along and do some writing too, in the Shed during the Festival, where you can find us in Gillingham on the High Street on Friday, at Chatham near H Samuels on Saturday and at Rochester Castle Gardens for the Big Picnic on Sunday. Bring a rug, and a picnic and you can listen to us read from the new booklet. We will be typing up as many of the contributions from the weekend as we can and adding them to our online version of the publication – ‘The Seed Compendium’. We will also be tweeting live poems from the Festival, follow us on @WordShed. The whole project has been made possible with a Spark commission from the FUSE Medway Festival. If you come to The Word Shed over the weekend, and would like to give us any feedback, to help us develop future live literature events, please fill in our quick online survey. Previous PostUnwrittenNext PostFuse Festival update!